Nigel Hunt,arrested at Madrid airport after he flew in from Thailand. 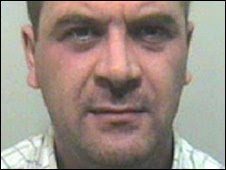 Nigel Hunt, from the Rawtenstall area of Lancashire, was jailed for five and a half years in 2004 for conspiracy to supply controlled class A drugs. But he absconded from Kirkham Prison in August 2006, prompting a manhunt which ended in his arrest at Madrid airport after he flew in from Thailand. Lancashire Police said he was currently awaiting extradition to the UK. There is no hiding place and we will work with our colleagues across the globe in order to bring people to justice Det Insp Simon Brooksbank, Lancashire Police The force's Serious and Organised Crime Unit was granted a European arrest warrant in December 2006. It allowed officers to make inquiries through Interpol and they learnt Hunt was due to travel from Thailand to Spain on 12 February. Lancashire officers worked closely with their Spanish colleagues to ensure that Hunt was arrested as he landed, the force said.